A robust democracy reform package that will give everyday people a bigger voice in politics and to create a more ethical and accountable government. Demand Congress support the For The People Act -- and its big and bold democracy reforms. We the People deserve a responsive, accountable government that gives us all a stronger voice and puts our needs ahead of special interests. The House of Representatives introduced their first 2019 priority — the For The People Act, also known as H.R. 1 — is the boldest democracy reform since Watergate. It’s a massive overhaul of money-in-politics, voting, and ethics laws — all to make our democracy more inclusive. Victory won’t come easily. We will need to fight to make to ensure H.R. 1 passes. We need to prepare right now for a multi-year fight to protect these bold reforms and pass them to ensure that all Americans for generations to come have a healthy democracy, built on transparency, trust, and the full participation of We the People. What is The For the People Act? For The People Act is a multifaceted bill addressing voting rights, money-in-politics, redistricting, government transparency, and ethics. Many parts of the bill are reforms Common Cause has successfully won at the state and local level, often with bipartisan support. Now, the For the People Act is an opportunity to pass these important reforms at the federal level. It’s also the product of Common Cause members’ efforts in the midterm campaigns. We secured the pledges of more than 100 incoming members of Congress to our Democracy 2018 questionnaire to work aggressively to prioritize issues of voting rights, money-in-politics, and ethics. Here is a quick snapshot and some highlights, broken down by the three key issue sections of the bill. 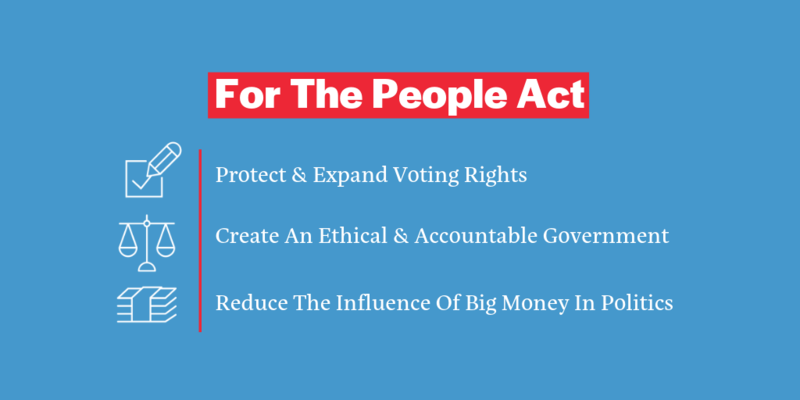 The For The People Act is a strong, comprehensive package— and we need to keep it that way– especially as special interest groups and others who prefer the status quo try to weaken it. We can’t let those who fear change stand in our way. Voters delivered a mandate— and an opportunity— to move our democracy forward. It's time for Congress to listen. Call now and demand a better Democracy! We need a democracy where voters are protected from discrimination and can make themselves heard at the ballot box — with sensible reforms like automatic voter registration. A democracy where electoral districts are drawn fairly so that every voter’s ballot is worth the same. And a democracy where ordinary Americans — more women, people of color, and working people — can run for office without relying on special interest Big Money. We already have the solutions that work. Letting independent redistricting commissions draw electoral maps is a check on the power of self-interested politicians. Small-donor, citizen-funded elections — which more than two dozen states and localities have enacted — are proven to allow ordinary people to run for office while helping ensure that elected officials stay accountable to the public interest. We must make sure that these vital reforms are included and stay in the For The People Act. Blog Post: What is the For the People Act – also known as H.R. 1? A robust democracy reform package that aims to give everyday people a bigger voice in politics and to create a more ethical and accountable government. The opportunity to move a series of hearings and a mark-up of the H.R. 1 marks the first viable move in nearly a decade to respond to overwhelming public demand for sweeping reforms. This document shows where ten key reforms in the For the People Act have been passed and implemented at the state and local level. Take Action: We deserve a government that works for us. Add your name to demand that Congress makes a bold show of support for our democracy -- and supports the strongest possible version of the For The People Act.